Our agent-specific cassettes operate with innovative electronic control from the host anesthesia delivery system. Aladin2TM Cassettes operate with innovative electronic control from the host anesthesia delivery system – an innovative technology for vaporizing anesthetic agents. The AisysTM CarestationTM electronic control helps provide exceptional benefits such as automatic recordkeeping of set agent concentrations and agent usage calculations. Agent specific Aladin2 Cassettes can be used to deliver isoflurane, sevoflurane, and desflurane anesthetic agents. The Aladin2 Cassette can be handled or stored in virtually any position. Weighing less than 3.4 kg/7.5 lbs, the Aladin2 Cassette can be easily carried and handled. 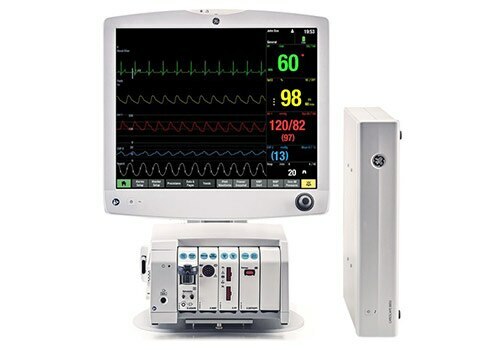 It enables automatic recordkeeping and gas usage calculation on the anesthesia system. Electronic control of the desired agent concentration provides agent setting data for automatic recordkeeping on the anesthesia system. Gas usage data provides an innovative tool for your low-flow savings analysis on the anesthesia system. During the recommended daily system check, the Aisys Carestation performs a check on the Aladin2 Cassette and electronic vaporizer. Aisys Carestation agent control is monitored up to 200 milliseconds during operation. In the Aisys Carestation, anesthetic agent control consists of two parts: the electronic control mechanism in the anesthesia system and the separate Aladin2 agent cassette. Agent concentration is adjusted by regulating the amount of fresh gas flowing through the cassette. A proportional valve is used to regulate the flow. Part of the fresh gas bypasses the cassette, so the more fresh gas allowed to pass through the cassette, the greater the concentration. Fresh gas flow, along with flows in and out of the cassette, are electronically measured for enhanced control. Each Aladin2 Cassette is magnetically coded, allowing the Aisys Carestation to recognize which type of agent cassette is inserted. See why GE Healthcare anesthesia products are being used in more than 100 countries. Highest level of monitoring excellence, consistent level of care, and comprehensive set of parameters in critical and perioperative care areas.